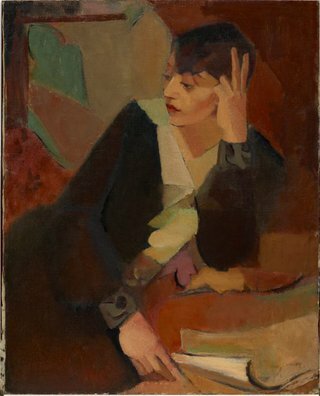 Black exhibited this painting in her first solo exhibition at the Macquarie Galleries in Sydney in 1930. It stands out as one of her most exceptional and formally resolved still life paintings. 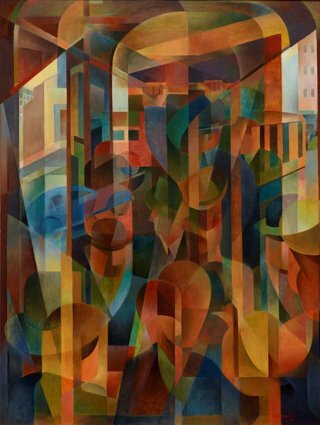 Having studied with the cubist André Lhote in Paris, the work reveals her understanding of Lhote's compositional principles of a geometric order where the fractured planes of cubist construction were ultimately integrated into a rhythmically driven whole. Yet the work also indicates Black's own developing aesthetic of a modelled realism that recedes into fragmented abstraction. Using the compositional structure of the prism, Black beautifully synthesises a sense of the solidity of the still life objects within the composition's geometric construction, achieving a unified model of both weight and abstraction. Cubism emerged largely from Picasso and Braque’s experimental collaborations in Paris between 1908 and 1914. 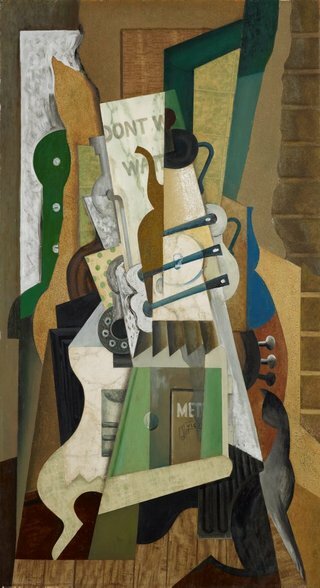 In cubist paintings, figures and objects are broken down into overlapping planes, combining multiple viewpoints in a single image to emphasise the mobility and composite nature of vision. This new approach to painting was influential around the world, and for many, cubism became synonymous with modernism. By the late 1920s, the painter André Lhote claimed, ‘there are thousands of definitions of cubism, because there are a thousand painters practicing it’. While the earliest phase of modern painting in Australia developed out of experiments with colour, by the late 1920s progressive Australian artists were redirecting their focus towards elements of cubist composition. 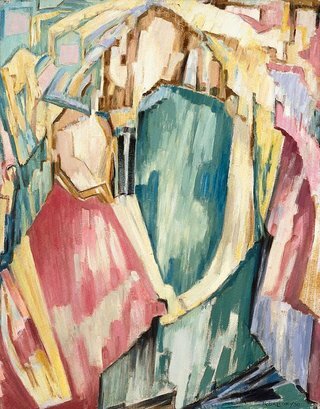 Some artists travelled overseas to acquire, as Dorrit Black stated ‘a definite understanding of the aims and methods of the modern movement and in particular the cubists’. Black and her Sydney colleagues Grace Crowley and Anne Dangar studied under Lhote and Albert Gleizes in France. Frank Hinder and Eric Wilson discovered cubism in America and Britain respectively. On their return to Sydney, these artists disseminated cubist ideas and methods, influencing both figurative painters and the emerging practitioners of abstraction. Grace Crowley was a central figure in the modernist movement which flourished in Sydney during the 1930s and 40s. She played a crucial role, both as teacher and artist, in introducing a classical, geometry-based cubism to Australian art. A graduate of Julian Ashton's Sydney Art School, and succeeding Elioth Gruner as a teacher there in 1918, Crowley studied in France with the cubist painters André Lhote and Albert Gleizes throughout the 1920s. 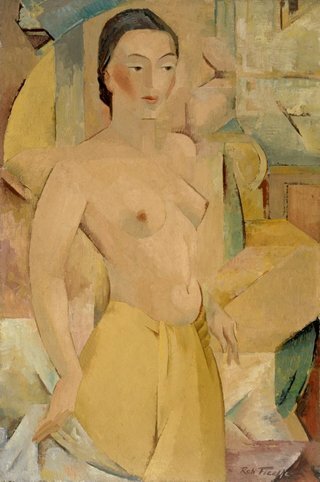 Completed on the eve of her return to Sydney in 1929, Portrait of Lucie Beynis depicts a professional model whom Crowley painted over a period of four mornings. In Lothe's modified version of cubism, the human figure is retained, held within a field of dissecting geometric planes and shafts of colour running through the body. This approach dominated Crowley's semi-abstract paintings during the 1930s, until her departure into pure abstraction in the 1940s. Frank Hinder's Tram kaleidoscope captures the essence of Sydney modernism. It synthesises elements of cubism, futurism and orphism to form an ambitious statement of the city as a dynamic, living organism. The painting is fragmented and presents simultaneous views of the tram and the outside street. Time and space are no longer linear and discreet, they have become intrinsically intertwined. The chaos, however, is ordered and unified by a repetition of forms. The cylindrical tram, distant buildings, a zooming car and crowd of anonymous commuters are integrated harmoniously into the composition. The Gallery owns a number studies for this work from 1939, though the painting itself was not undertaken until after the Second World War. These works highlight Hinder's role, together with other Sydney contemporaries, in forming a distinct, innovative artistic vision: a modern art for a modern metropolis. After winning the New South Wales Society of Artists Travelling Art Scholarship in 1937, Eric Wilson sailed to London and studied at the Royal Academy schools. A brief trip to Paris roused his enthusiasm for modern art, and he soon after moved to the Westminster School, London, where he studied abstract design, underpinned by cubist philosophy. 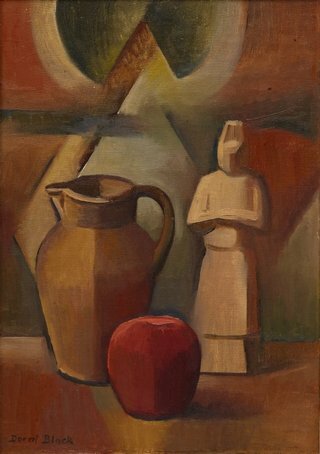 Wilson then studied at Amédée Ozenfant's Academy of Fine Arts, which strongly influenced him to develop a formalised pictorial manner derived from the cubist tradition. Abstract – the kitchen stove exemplifies this development in Wilson's work - he uses a domestic subject to explore formal elements such as colour, shape, surface patterning and texture. The painting is constructed around lines which delineate a triangular composition, its apex formed by the pot on the stove leading up into the stove-pipe. It demonstrates Wilson's attempt to create an 'orchestration of the formal elements into a symphonic whole'. 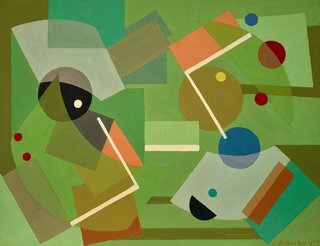 In the early 1940s, Ralph Balson moved towards complete abstraction, referring to his new flat, geometric compositions as 'constructive paintings'. His 1941 show at Anthony Hordern's gallery in Sydney has been acclaimed as the first entirely non-figurative solo exhibition in Australia. Balson continued painting in this vein for the next 15 years. 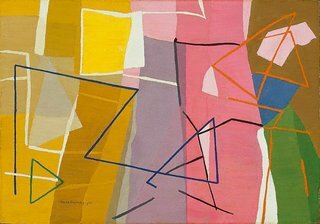 Around 1950, Balson simplified his forms further towards rectilinear shapes, echoing the abstractions of Piet Mondrian. Later in the decade he moved to a softer colour palette and clearly visible brushstrokes. 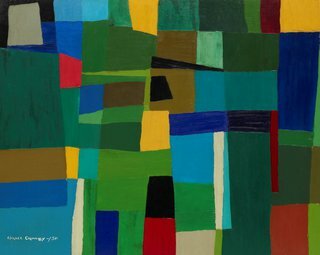 His colleague Grace Crowley shifted similarly towards geometric abstraction, preserving a more vivid use of primary colours and dynamic movement across the picture space. 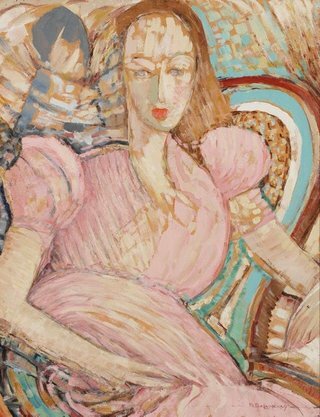 Mary Webb, who worked in Sydney and London in the 1940s in a figurative expressionist mode, travelled to Europe in 1949 and subsequently became a significant Australian abstractionist and collagist in Paris in the 1950s. Despite an active exhibition schedule in Paris, where her work attracted significant review, Webb maintained contact with Sydney constructivists Frank Hinder, Ralph Balson and Grace Crowley over this decade. 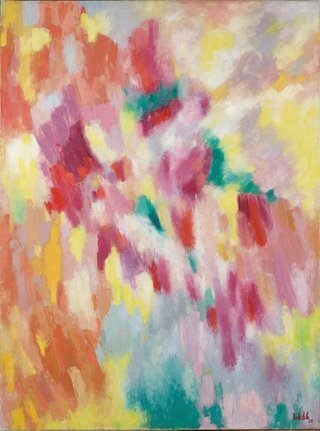 Joie de vivre was shown at Webb's solo exhibition at Galerie R Creuze in Paris, mounted only a month before her untimely death in December 1958. Webb's excursion into 'informel' abstraction in Joie de vivre, with its arresting sense of movement, pastel hues, and soft-edged cloud-like forms, represents the artist's most significant painterly achievement, and a singular contribution to Australian abstraction. This recent acquisition, newly rediscovered after over four decades in storage in Paris, is the most important of all currently known works by Webb.